The great military strategist and tactician Hashi conquered the three separate kingdoms of Okinawa and united them under his rule. One of the first things he did was move the capital and seat of government from Urasoe to Shuri. When Hashi’s father passed away in 1421, the Ming Emperor gave Hashi the title of “Sho Hashi, King of Ryukyu”. This was after he had conquered Hokuzan in the north but a few years before he had conquered Nanzan. The Chinese, as a token of their recognition, also gave him a large tablet with the Chinese characters for Chuzan inscribed on it. Sho Hashi showed his appreciation (and importance) be having a gate erected at the entrance to Shuri castle where he installed the tablet for all to see. He also had a bell created that is now called the bridge of nations bell. The inscription on the bell recognizes the importance of trade with all countries as the key to his kingdom and Okinawan prosperity. This bell was also hung at the new entrance gate. Today the original bell is at the Okinawa prefectural museum and a replica is at Shuri castle. 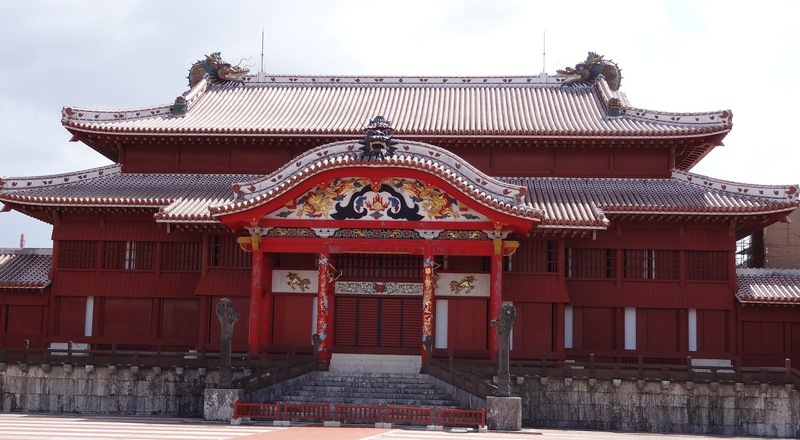 See my post on Shuri Castle for pictures of the main gate and the Bridge of Nations Bell. Although the old kingdoms of were destroyed, Sho Hashi kept the three districts geographically intact. But now they were called Kunigami, Nakagami and Shimajiri instead of Hokuzan, Chuzan and Nanzan. The local aji were still the basis of control of their respective outer areas. With the entire kingdom under his control, Sho Hashi was now able to collect and use all the resources of the island to build and support his desires at Shuri. He taxed the villages severely and used the proceeds to build up Shuri, the seat of the royal family and the government. He also invested in Naha and Tomari, his key trading ports and links to international commerce. Villagers were left with very little of the product of their labors and led hard lives. Okinawa had few natural resources of its own. Trade with other countries was the key to increased wealth, which he promoted strongly. He kept the loyalty of the local aji by military force, but more importantly by allowing them to share in the lucrative trade and profits with China and other countries if they were cooperative with him. He had excellent diplomatic skills with the Chinese Ming dynasty. This further led to investment in ships, trading ports and the fostering of strong diplomatic ties with the Chinese. The reign of Sho Hashi marks the age when Okinawan life began to absorb many of the unique elements which define it today. The classical body of Okinawan song and tradition originates from this era, as does cloth making and other arts and crafts. In 1439 a permanent Okinawan settlement was built at Fukien (Fujian) province for more effective trade with China. Fukien is in southern China across the sea from modern day Taiwan. It was here that Okinawan students came to serve as clerks and also to learn Chinese language and customs. This village lasted until 1875, when the Ryukyu kingdom was dissolved by Japan. Because of this intimate linkage to China, much was learned and adopted by the Ryukyu royal court. The unique Ryukyu tombs, bridges, food, textiles, leisure activities, and manners were all based on lessons learned and brought back by the Okinawan students and traders. Trade expanded significantly. Ryukyu trade ships reached all the way south to the Indies and as far north as Korea. All kinds of articles of commerce passed through Naha. Okinawans were exposed to a wide variety of different cultures. After returning to Naha from our Ishigaki-Taketomi trip, the next morning we got a taxi and ventured to the Okinawa Prefectural Museum. 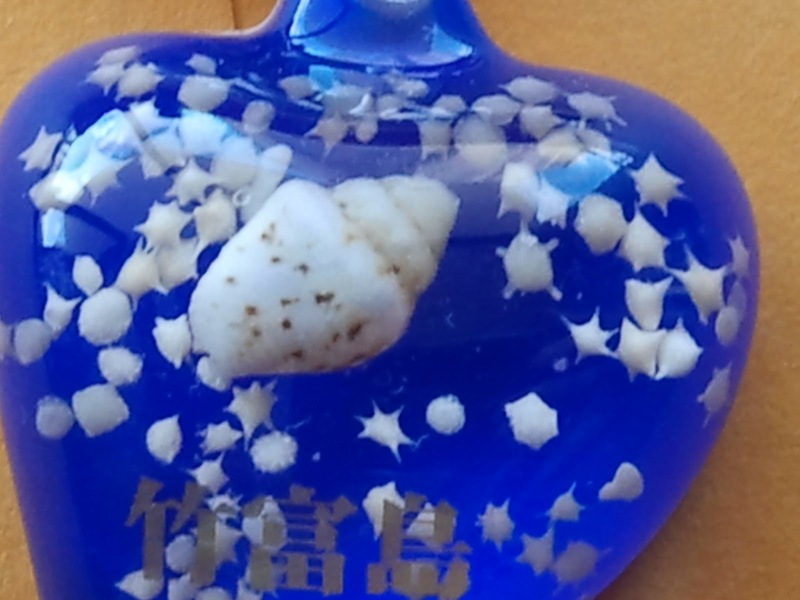 Here is a link to the Okinawa Prefectural Museum website. Located in Naha, it is actually two museums in one: a museum and an art museum. We only attended the museum on this day. You can buy a ticket to either or a combined admission ticket to both. Also, the museum provides an audio cassette in English (and maybe other languages) that you can carry with you as you tour the exhibits. The museum was excellent. It has sections on Okinawan history, natural history of the islands, archeology, arts and crafts, and folk customs. We spent an entire morning going through all the exhibits that were on display. In the gift shop I looked for some good books in English about Okinawan history, but didn’t find any. If you are interested in Okinawan history, I highly recommend this place. The following day, one of our group led us on an excursion to Shuri castle. We walked to the monorail station from our hotel, about a 5-10 minute hike along Kokusai Dori. The monorail is clean and quiet. It runs from the Naha airport at one end to Shuri castle at the other, a total of 15 stops in all. You can buy a single fare, or in our case we all got one day passes that can be used for unlimited rides for one day. Signs are in English as well as Japanese, making it easy for people like me to use it. After we arrived at the Shuri station, it was then a 10 or 15 minute walk (uphill) to the entrance of the castle. Along the way we passed the steep castle stone walls. If you are interested in old Okinawa and the Ryukyu Kingdom this is another place that is a “must see” in addition to the Prefectural museum. Shuri castle was the home of Okinawan royalty for hundreds of years until the royalty was disbanded in 1879 with the Meiji restoration. The entire place was destroyed in World War II during the battle of Okinawa. But the Okinawans have restored it to much of its original glory. You can get a feel for the way the royalty lived. The large courtyard to receive guests and hold ceremonies, the king’s throne and crown, a place to do business with foreign visitors, and so on. We spent several hours here, looking at the exhibits and just absorbing the atmosphere of the place. Here are some photos. After we were finished touring the castle grounds, we headed back to the monorail. We first took a wrong turn and walked down a very steep hill on stone steps, through a residential area with many old stone walls. Very pretty. But the wrong direction. After realizing we were lost, and getting our bearings, we headed in the correct direction (back up the hill) and finally we got back to the Shuri monorail station. From there went to a large department store for lunch and a bit of shopping. That monorail stop was also a close walk to the Okinawan Prefectural Museum so some of our group that had not yet seen it went there instead of shopping. In late afternoon we finally back to our starting point and walked back to the hotel. On the way back, Kokusai Dori Street was blocked off to vehicle traffic (this was around 4 in the afternoon) and a group of Eisa dancers started to perform in the street. They drew a rather large crowd. The next three days we spend shopping since we had a long list of items from our own needs and those of our friends and family. We just made our luggage and weight limits for the return flight home without needing to pay extra. The largest bookstore in Okinawa, Junkudo, is a couple blocks off Kokusai Dori, and is fills several stories. Books written in English are on level three. Although there was a section on Japan history and culture, I was disappointed that more books specifically devoted to Okinawa were not available. Nevertheless I was able to find a few interesting titles. After a stop at the Starbucks, where we bought several of their Okinawan coffee mugs to bring back as gifts, we headed into the famous Heiwa Dori shopping area, perhaps the largest maze of shops one can find in Okinawa. You can buy just about anything there, from clothes, to sanshins, to shisa lions to kimonos, etc. You name it. Speaking of kimonos, my wife had placed an order with one of the shops in Heiwa Dori for a kimono earlier in the trip. At the time she placed the order the shop keeper gave her a complimentary pair of tabi (Japanese socks) worth around ten dollars. When we returned to pick up the kimono, the lady shop keeper told us to wait just a minute, and then disappeared. She came back a few minutes later with a huge package of dried fish to give us as a gift for buying the kimono! Unbelievable! She had obviously gone out to a nearby store to buy it when we showed up. I don’t know if this custom exists in other parts of Japan, but this was the second time I experienced it – the first time being in Ishigaki. We came back home somewhat exhausted but very satisfied. We have lots of good memories and photos. We are already planning our next trip to Okinawa. 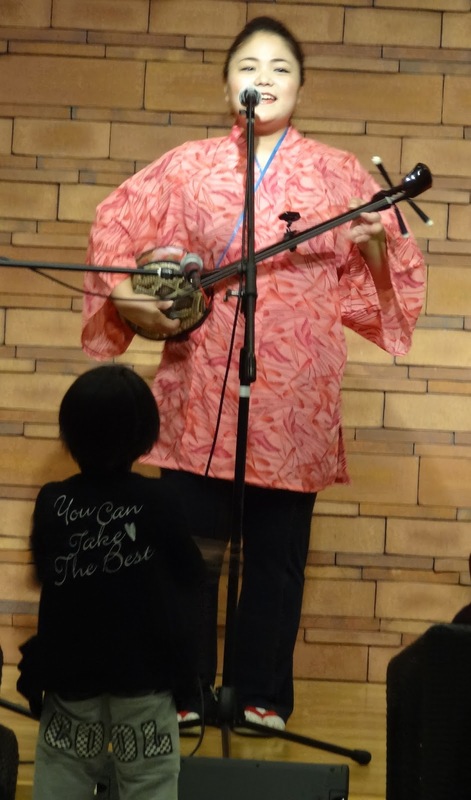 After my wife’s successful sanshin test our next Okinawan adventure was an excursion to the southern islands of Ishigaki and Taketomi. It was an overnighter trip. We left Naha airport early in the morning, and arrived in Ishigaki an hour later. Once there, we were met by our tour guide and our bus, where we proceeded to drive around the entire island, capturing the sights and sounds of the place. My first impression of Ishigaki was that it was a very rural place. As our bus wound its way along a two-lane road, we saw landscape sparsely populated with simple shacks and houses along the very green countryside. Several times we spotted a goat perched on a rock or in a field, standing like a statue as we went by. Our first stop was a lookout point at the southern part of the island, from where you can simultaneously look to your right and see the East China Sea, then look to your left and see the Pacific Ocean. We then stopped to see a grove of palm trees that are unique to Ishigaki, the Yaeyama-yashi palm. These trees are only found in Ishigaki/Iriomote and can grow to heights over 60 feet. The ones we were shown were located inside a jungle area that had mosquitoes and leeches. The walkway to the site was over loose rocks and up a significant incline. Black pearls are grown in Ishigaki, and so of course we found ourselves at a black pearl shop – where prices were not cheap. One large black pearl, cultured right offshore in shallow water, was around $1,000 (yes, dollars, not yen). A string of them was, well, you can do the math. None of our group decided to buy any that day. Across the street was an awamori shop and this drew a lot of interest. There was free sampling of the various specials of the day and we ended up buying two bottles of a plum flavored liquor. The weather in early April was cool by Hawaii standards. Highs were in the upper 60’s to mid 70’s. Most of the time the skies were overcast, with occasional drizzle. When the sun did come out, the humidity made it quite hot. The Deigo tree flowers were just starting to blossom while we were there. These red flowers are famous in Okinawa, and are mentioned in many Okinawan songs. One of the most fascinating stops for me was the Minsa clothing store, where we got the explanation of the minsa design. It is a patch of 4 squares and 5 squares, and they overlay to make a solid piece. It is something that women give to their husbands as a symbol of undying love and faithfulness. Colors of the fabric are many, and we saw weavers actually making the cloth by hand in the shop. Several of us bought handbags, shirts, and coin purses here. 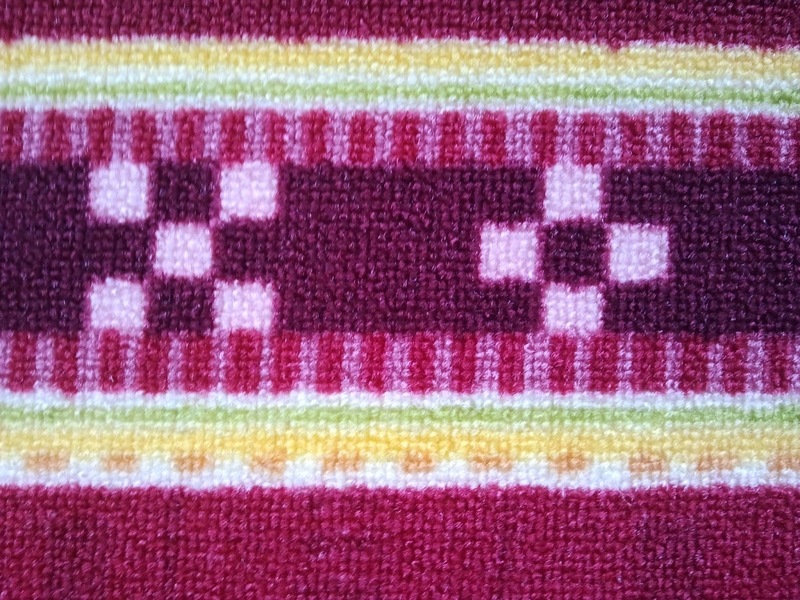 Minsa Pattern of 5 and 4 Squares. They Overlap to Make a Perfect Fit. Here we encountered a custom that was quite surprising (to me anyway). After we bought our items at the minsa shop, the owner gave us an O-miyage (gift)! It was a bag of Ishigaki sugar, which comes in brown lumps and can be eaten as candy. I never before heard of a shop keeper giving the customer a gift for buying something, but it happened to us again in Naha (more on this later). After a stop for an Okinawan set lunch, we then drove on to the big city of Ishigaki, which is a little over 40,000 people. On our way to our hotel we drove past the houses of the Okinawan singers Begin, and Rimi Natsukawa. Both of these entertainers are from Ishigaki and still live there. At night at the hotel, following dinner, there was a free minyo show featuring a local entertainer. She was terrific. Afterwords, we topped off our day with a cocktail at the hotel’s top floor bar, which gave a nice view of the city lights of Ishigaki at night. Our Evening Entertainment and a Mesmerized Fan! 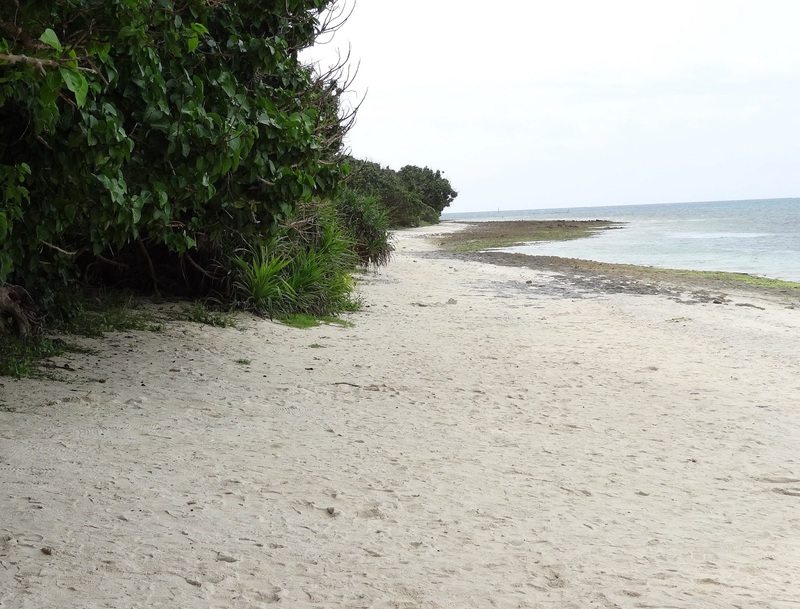 The next morning, we hopped on a bus and headed for the ferry port to visit the small island of Taketomi. (Next Post – Taketomi).